For many times Android smartphone users encountered a very big problem: low memory (RAM) for running apps or games without lags... So, that's the reason for, many app developers made "tasks killing" apps - some .apk little programs designed to kill useless tasks and free gadgets memory to allow huge consuming RAM apps to run without lags. I tried several Android softwares to manage my running apps, but only one seems to be efficient, and that's called Advanced Task Killer or ATK. It can be highly customized (what apps to kill and/or not), it has a very easy to use interface, even for new users, and it has different levels of using. - Crazy (not recommended for beginners) - it kills all apps that are not started and used by you. 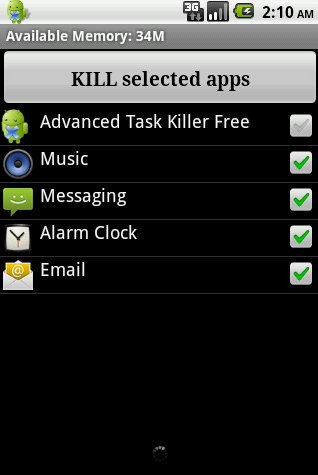 Of course, you could not use the Auto Kill function if you don't want, but in that case you need to check each app and setup it when to kill or keep alive it. Anyway, to avoid any troubles for using ATK, you should keep it as simple as possible, without trying to highly customize it (except the case you're an android programmer).